Very rare Bird's-Eye View of Bangor Maine. Only 3 known examples. Bird's Eye View of the City of Bangor Penobscot County, Maine, 1875. 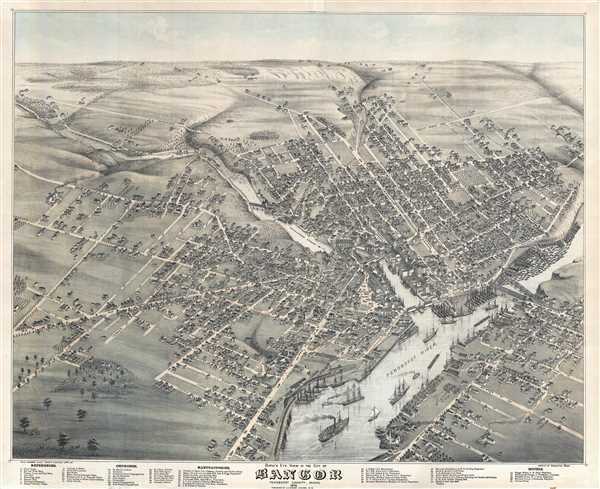 An exceptional 1875 Bird's-Eye View Map of Bangor, Maine, by Augustus Koch. Koch presents Bangor as seen from the south, looking north, with the Franklin, Central , and State Street Bridges over the Kenduskaeg Stream forming a central focal point. Some 57 civic buildings, hotels, churches, and business are identified with a numeric key at the base of the map. Koch had an engineer's passion for accuracy that is very much on display here - even the names of the ships, 'The City of Richmond' and 'Kayandon,' among others, were known Bangor vessels. This view was drawn by Augustus Koch and published by J. J. Stoner. It was printed by Charles Shober and Company, Lithographers, Chicago. Today Koch's view of Bangor is extremely rare with only three known examples surviving in institutional collections. Koch drew his cities with considerable care, consistently depicting his subjects as if seen from very high viewpoints. The horizon lines appear close to the tops of the images, and the body of each print is thus full of urban detail. Koch also used a distinctive format, making his horizontal dimension not much greater than the vertical. The date of Koch's death is unknown. His career saw the publication of some 110 views in at least 23 different states. Joseph John Stoner (December 21 1829 - May, 1917) was a Madison, Wisconsin based publisher of bird's-eye city views active in the late 19th and early 20th centuries. Stoner was born in Highspire, Pennsylvania and apprenticed as a carver of ornamental chairs before turning to publishing. He partnered with the bookseller Ephraim T. Kellogg of Madison, Wisconsin, for whom he was a traveling agent. His career in views began around 1867 when he met and befriended the bird's-eye view artist Albert Ruger, who was sketching Madison that year. Ruger and Stoner partnered and began publishing city views under the imprint 'Ruger & Stoner.' The partners traveled extensively through the Midwest publishing some 11 city views under their joint imprint - although there may be as many as 62 others unattributed. The partnership partially dissolved in 1872 although they continued to work together on a contractual basis. Stoner subsequently traveled even more extensively hiring young artists to sketch city views in such wide ranging destinations as Texas, Maine, and Oregon, among others. He produced a total of some 314 views with various artists including: Albert Ruger, Herman Brosius, Thaddeus M. Fowler, Augustus Koch, Albert F. Poole, Henry Wellge, Joseph Warner, Camille N. Drie (Dry). Stoner died in Berkeley California in 1917. Very good. A few minor verso reinforcements. Else clean. Reps, John, Views and Viewmakrs of Urban America (University of Missour, Columbia, 1984), #1178. Library of Congress, Map Division, G3734.B2A3 1875 .K6.